And it worked. What does it mean to put that keyword before the declaration? What exactly will it do and/or restrict in terms of what can be done to that object? It means that only one instance of a static field exists even if you create a million instances of the class or you don't create any. It will be shared by all instances. Since static methods also do not belong to a specific instance, they can't refer to instance members. In the example given, main does not know which instance of the Hello class (and therefore which instance of the Clock class) it should refer to. static members can only refer to static members. Instance members can, of course access static members. Side note: Of course, static members can access instance members through an object reference. : Depending on the runtime characteristics, it can be one per ClassLoader or AppDomain or thread, but that is beside the point. It means that there is only one instance of "clock" in Hello, not one per each separate instance of the "Hello" class, or more-so, it means that there will be one commonly shared "clock" reference among all instances of the "Hello" class. So if you were to do a "new Hello" anywhere in your code: A- in the first scenario (before the change, without using "static"), it would make a new clock every time a "new Hello" is called, but B- in the second scenario (after the change, using "static"), every "new Hello" instance would still share and use the initial and same "clock" reference first created. The static keyword means that something (a field, method or nested class) is related to the type rather than any particular instance of the type. So for example, one calls Math.sin(...) without any instance of the Math class, and indeed you can't create an instance of the Math class. For more information, see the relevant bit of Oracle's Java Tutorial. Java unfortunately allows you to access static members as if they were instance members, e.g. The static keyword in Java means that the variable or function is shared between all instances of that class as it belongs to the type, not the actual objects themselves. So if you have a variable: private static int i = 0; and you increment it (i++) in one instance, the change will be reflected in all instances. i will now be 1 in all instances. Static methods can be used without instantiating an object. Hello hello2 = new Hello(); // here staticValue = "abc"
hello2.staticValue; // will have value of "abc"
That's how you can have values shared in all class members without sending class instance Hello to other class. And whit static you don't need to create class instance. Static is a Non Access Modifier. 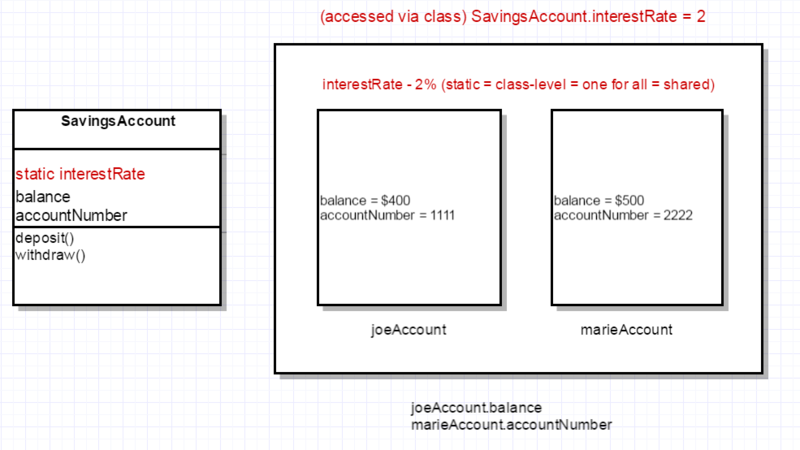 The static keyword belongs to the class than instance of the class. can be used to attach a Variable or Method to a Class. Since instance variable gets the memory at the time of object creation, each object will have the copy of the instance variable, if it is incremented, it won't reflect to other objects. 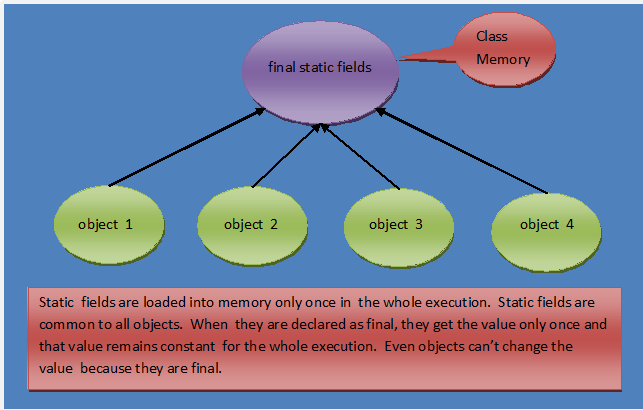 In this case static variable will get the memory only once, if any object changes the value of the static variable, it will retain its value. From inside a static method (which belongs to a class) you cannot access any members which are not static, since their values depend on your instantiation of the class. A non-static Clock object, which is an instance member, would have a different value/reference for each instance of your Hello class, and therefore you could not access it from the static portion of the class. This discussion has so far ignored classloader considerations. Strictly speaking, Java static fields are shared between all instances of a class for a given classloader. An interest rate of 2% is applied to ALL savings accounts. Hence it is static. A balance should be individual, so it is not static. A field can be assigned to either the class or an instance of a class. By default fields are instance variables. By using static the field becomes a class variable, thus there is one and only one clock. If you make a changes in one place, it's visible everywhere. Instance varables are changed independently of one another. "without regard or relationship to any particular instance"
Static makes the clock member a class member instead of an instance member. Without the static keyword you would need to create an instance of the Hello class (which has a clock member variable) - e.g. I have developed a liking for static methods (only, if possible) in "helper" classes. The calling class need not create another member (instance) variable of the helper class. You just call the methods of the helper class. Also the helper class is improved because you no longer need a constructor, and you need no member (instance) variables. There are probably other advantages. The keyword static is used to denote a field or a method as belonging to the class itself and not the instance. Using your code, if the object Clock is static, all of the instances of the Hello class will share this Clock data member (field) in common. If you make it non-static, each individual instance of Hello can have a unique Clock field. Create an instance of your Hello class inside the main method and access all it's fields and methods the way they were intended to in the first place. Can also think of static members not having a "this" pointer. They are shared among all instances. The static method cannot use a non-static data member or directly call non-static method. this() and super() cannot be used in static context. When run some project firstly load static things(variables, methods, blocks..). When run this project main method load first. Because its static method. Then it look object "a" object .But object a not define yet. Because its non static. Then come like this error. Not the answer you're looking for? Browse other questions tagged java static oop language-features restriction or ask your own question. In laymans terms, what does 'static' mean in Java? What is a static ArrayList? How can I get rid of “static”? Why can't I write a static string? Why should you create a new instance of a class?